Have you every wanted to eat something based strictly on how amazing it looked. 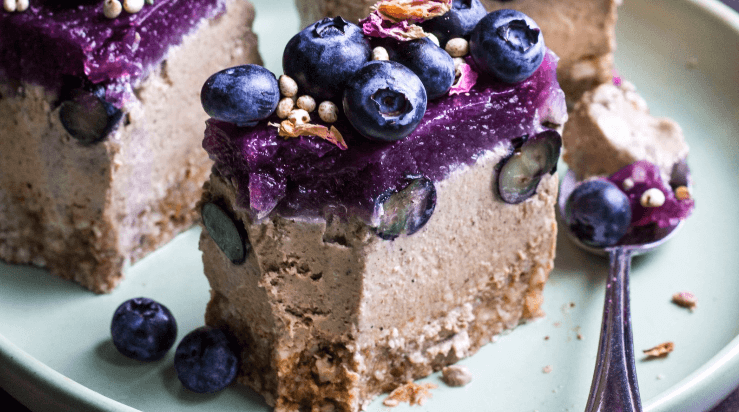 That’s why I wanted to try this Vegan Almond Mousse With Blueberry Topping recipe. I mean look at it. This is a beautiful vegan food waiting to be eaten. I’m not even sure how to describe this delicious vegan recipe. Have you ever tried something like that before? It doesn’t happen often but this recipe may just have me speechless. Which isn’t good when you are sharing a recipe. You get this really delicious almond/coconut based for starters. This is a nice crunchy and flavorful crust that really holds all the other flavors together in my opinion. You really love it with every bite. So where is the vegan almond mousse? This filling is to die for and I’m not even exaggerating. With coconut cream, almond butter, sugar, and blueberries, you get this really amazing and sweet filling that is just divine. You really could stop right here without any topping. Oh but therr is a topping. A delicious, sweet, glorious, blueberry topping. You can make it with fresh or frozen blueberries, sweeten it up, and it’s just amazing. It’s an homemade blueberry jelly topping that’s perfect to top this treat off. You can tell in these photos and this recipe from Rainbow Nourishment that it’s special. 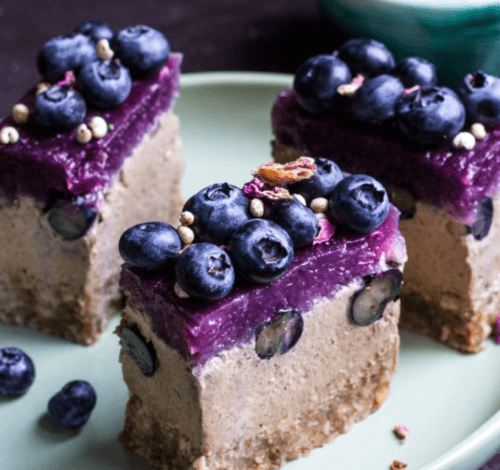 You can get the recipe for Vegan Almond Mousse With Blueberry Topping on their site by clicking here. Yup so get to it ???????????????? Omg this looks so good ???? Anna Fraser this looks good. Lindsey I would do a lot of things to be eating this right now. Can’t open for the recipe…. We’re gonna become fat vegans ??? ?